Do you enjoy gardening? Do you also enjoy creating your own artwork based on garden scenes? 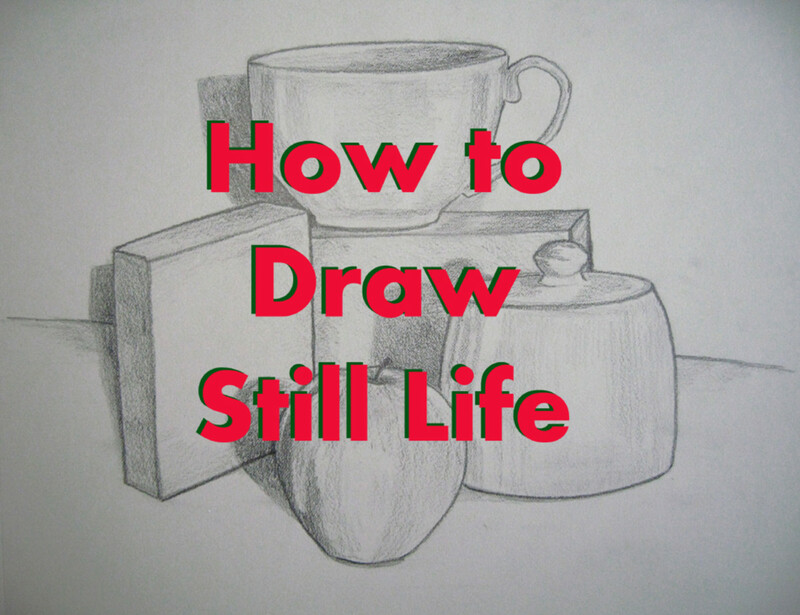 If you like to draw then there is very little need to go out and buy artwork, especially when you can create your own. The other day my friend Wanda LeBlanccochee shared a beautiful picture of roses that she took in her garden on Facebook, and I offered to create an illustration based off this amazing photograph. Have you ever wondered about how you draw a rose? 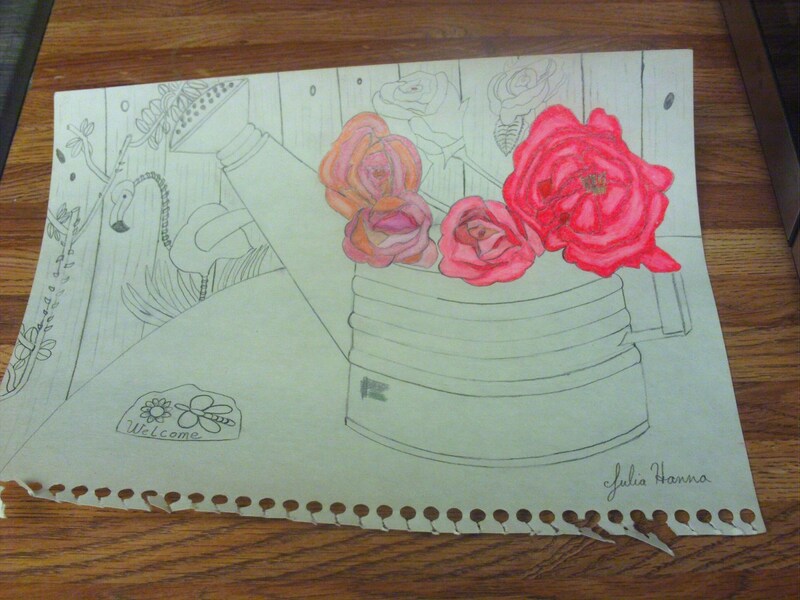 Anyone who loves flowers and roses will want a way to preserve and remember this spring, and you can do so by drawing your own picture of roses. To draw the rose you must first note how the inside petals are a bit more snug around each other in the center, and how the outside petals are looser and larger. 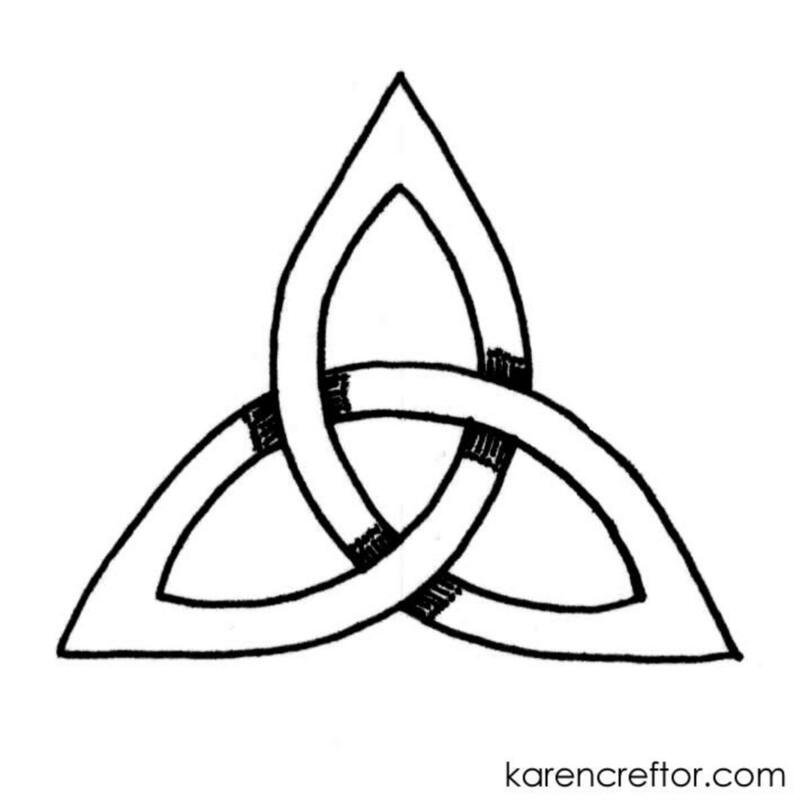 Keeping this in mind will make drawing the rose quite easy. 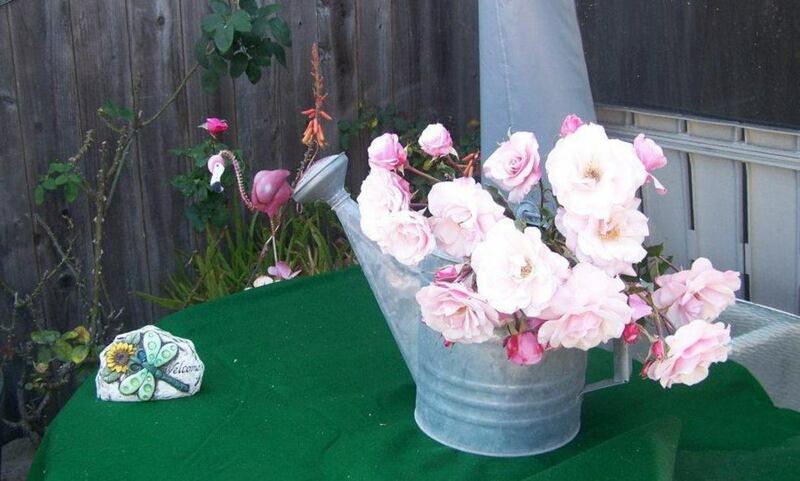 The photos and videos below document the stages of sketching roses in a watering can. I always like to scan the final piece of artwork so I can use it for cards and other creations, but I also document the entire creation of my drawings and paintings. Sometimes the early stages of a drawing and painting can also be used when I create other imagery. 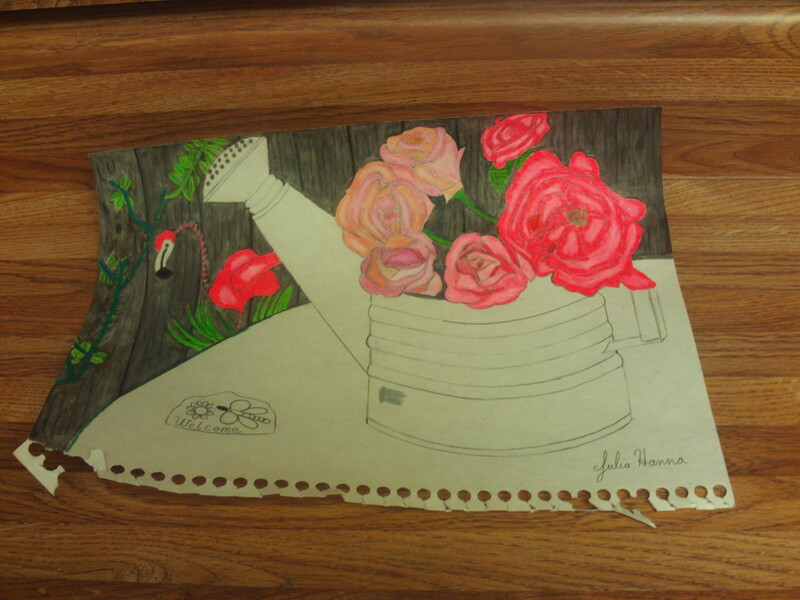 Above is the amazing photograph Wanda LeBlanccochee took of roses in the watering can, which was inspiration for this drawing. 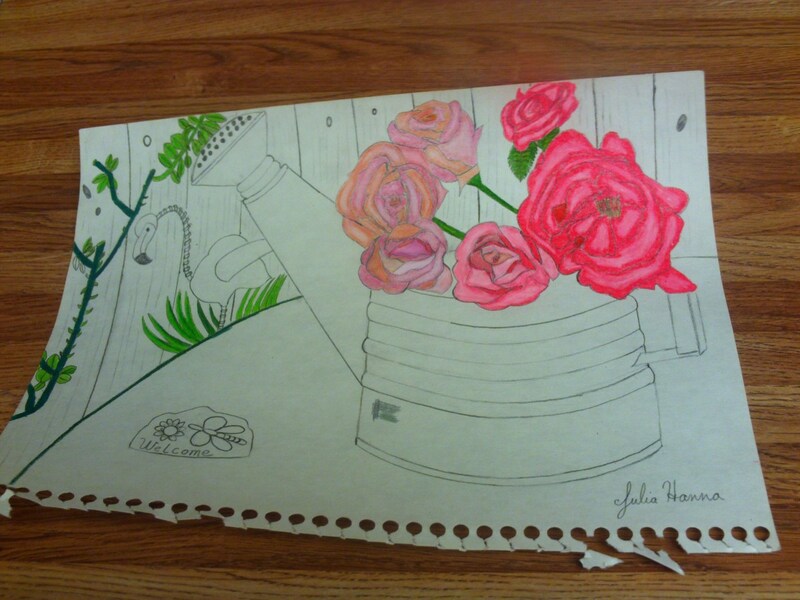 The first phase of this drawing was to sketch out the roses, watering can, fence, and other elements to the original photograph. I decided to use artistic license, and I kept and deleted certain things. 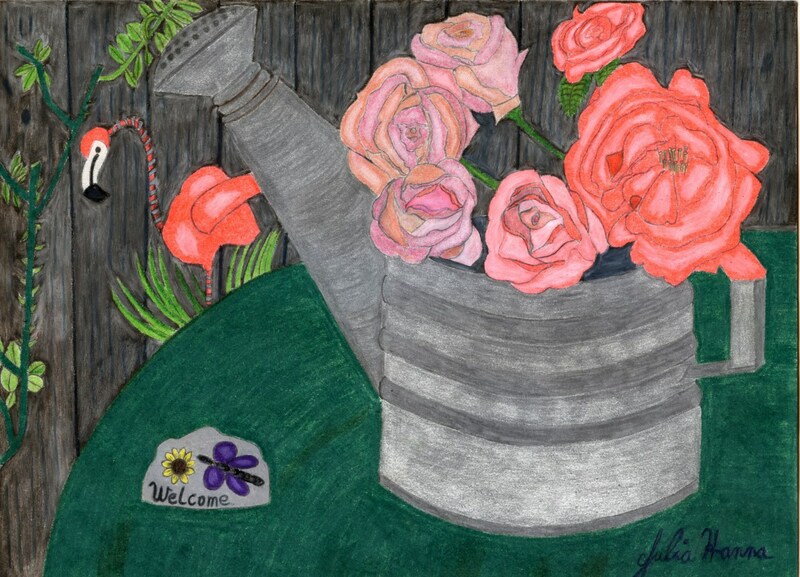 To me the major elements of this image was the roses in watering can, the bush with the cut roses in the background, the flamingo decoration, the welcome greeting sign, and the fence, so these were the pieces I decided to include in my sketch. When I draw I often take an original image and change things around a little bit, so to speak. In the photograph above I am drawing in more of the details of the roses. The video above showcases what the drawing looked like before I added any color to it. Above I am beginning to add the various shades of pink to the roses, and I am using a white colored pencil to burnish and add highlights. 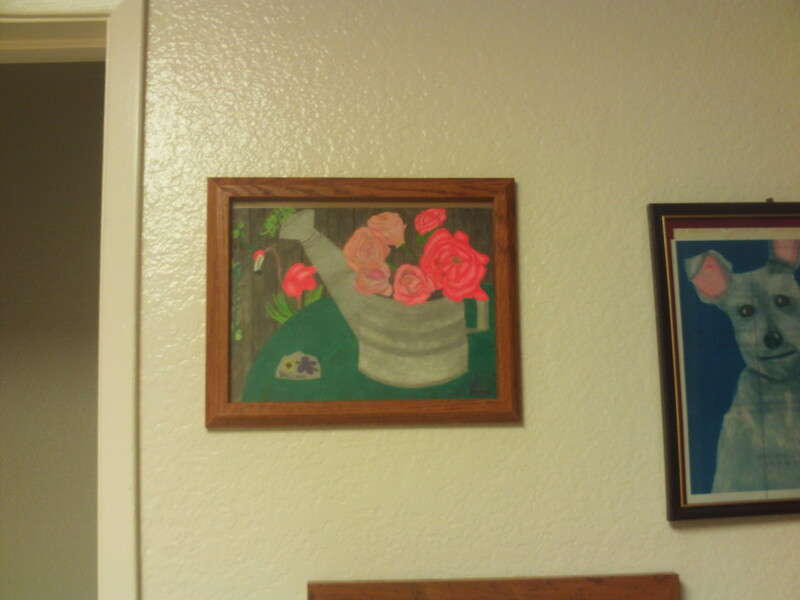 The video above documents the process I made with coloring in the pink roses. 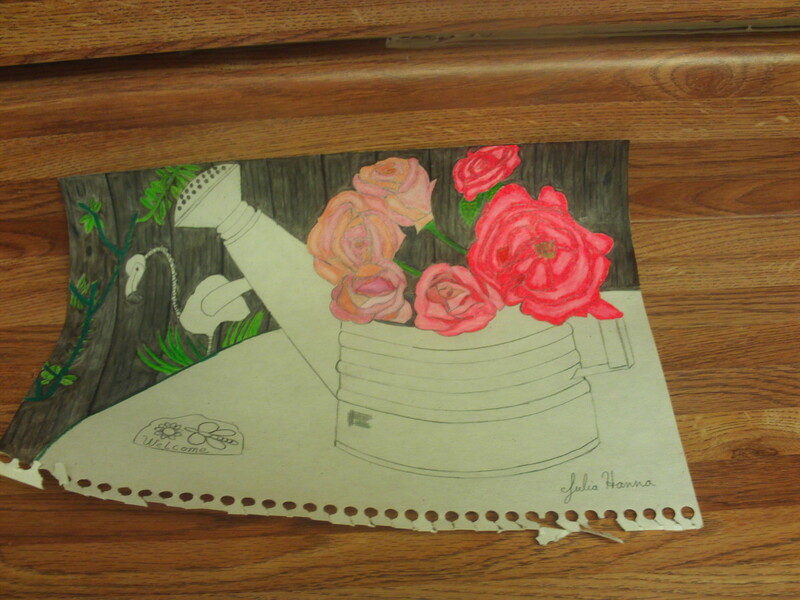 In this phase of the drawing I am beginning to color in the rose bush from which I imagined the roses were cut. Every picture tells a story, and in this one I imagine this is the bush where the roses were once lightly swaying in the wind. I used a burnishing technique to color in the fence. On some parts I first colored the board of the fence with white colored pencil, and then highlighted the knotted spots with a black colored pencil. I then heavily burnished the drawing of the board on the fence with a sepia colored pencil, but on some of the other boards of the fence I started out by heavily laying down the sepia color and then went over it with the white colored pencil. The burnishing technique achieved the look of the fence, which I really like. In this phase of the sketch the fence is about halfway shaded in. 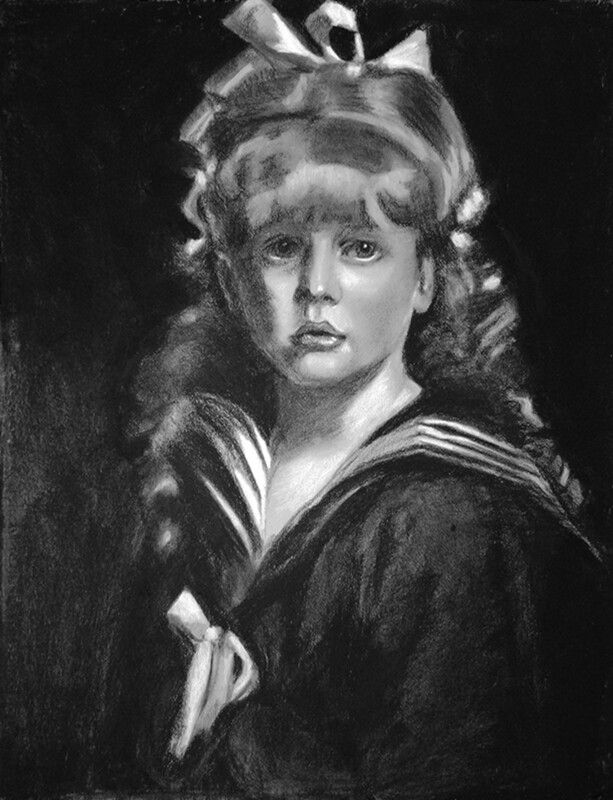 I continue to use the black colored pencil to undercolor the grainy and knotted parts of the wood, and then blend this in with the sepia and white colored pencils by using the burnishing technique. 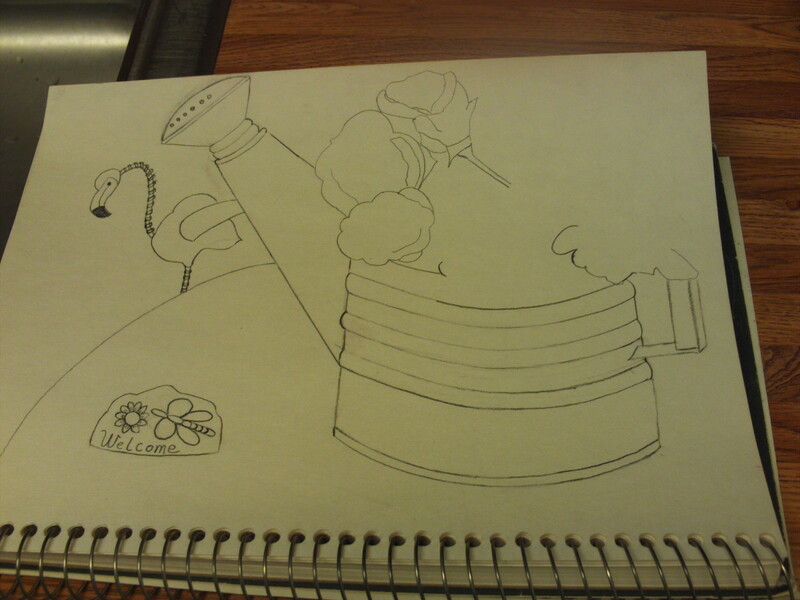 The finished is now completely colored in and I will now finish the rest of the drawing. In the video above you can see how the fence is completely colored in. I used a burnishing technique of layering white, sepia, and black colored pencils together to achieve the grainy look of the boards on the fence. 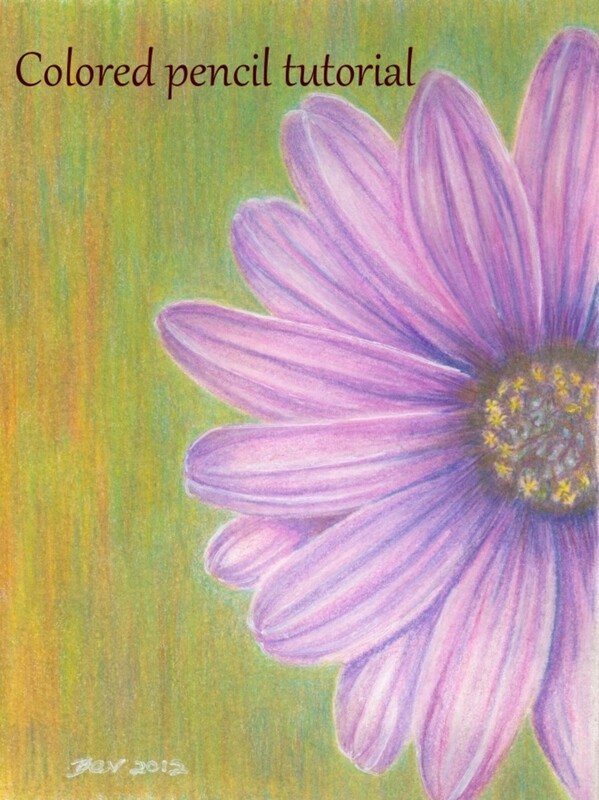 For this drawing I used a mix and match of Prismacolor pencils, and some other pencils I had from an artset called Gallery. 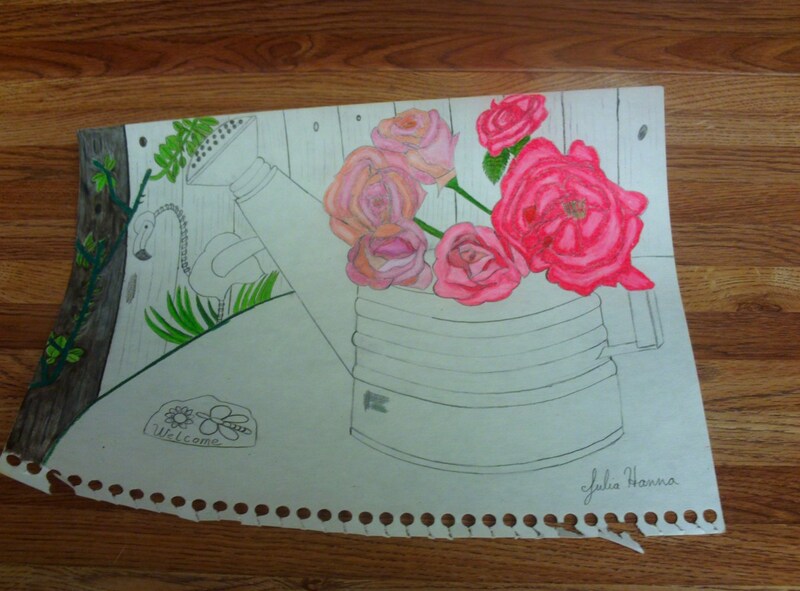 I tend to mix and match my colored pencils, but I must say the Prismcolor red neon pencil I used for the roses and the flamingo really made the drawing pop, and I was pleased with how well the sepia and white colored pencils blended together when I created the fence. I have noticed the few Prismacolor pencils I have had since high school have lasted through quite a few colored pencil drawings, but this is because I have mixed and match these with other sets. It is tempting to buy a new set of Prismacolor pencils since these are about to run out, and the pleasure I had with using these pencils in this particular drawing has really made me consider doing so. Anticipation was running high as I was nearly finished coloring in the green table cloth. 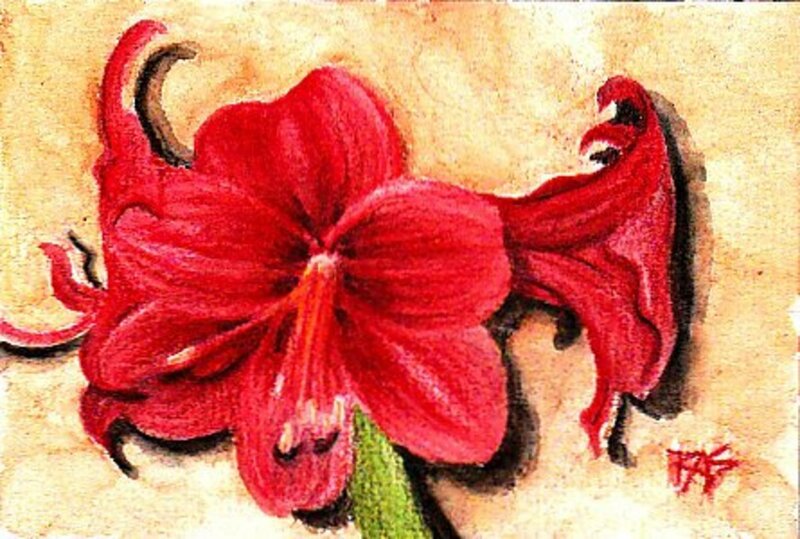 There is just something rewarding about the exhilaration and thrill of almost being finished with a colored pencil drawing. I hung my drawing on the fridge to admire the final result. 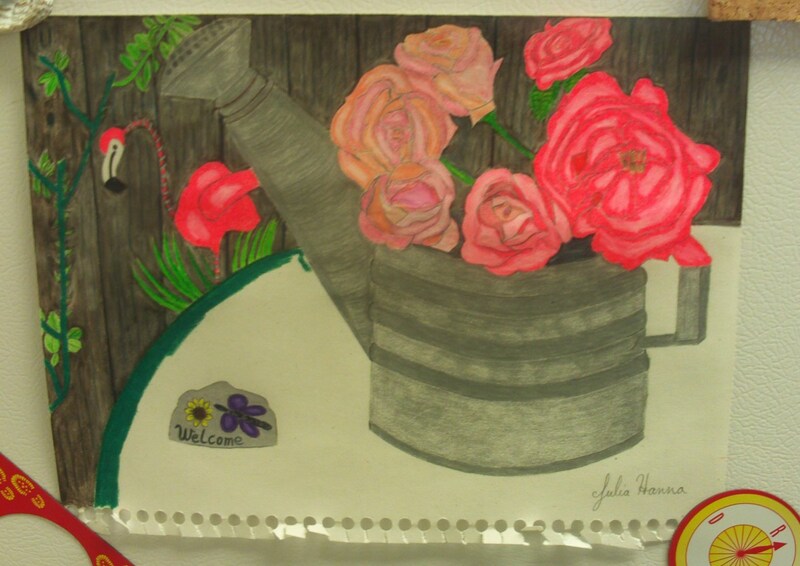 The video above shows what the colored pencil drawing of the roses in the watering can looked like upon completion. This is an old project, but still a favorite. 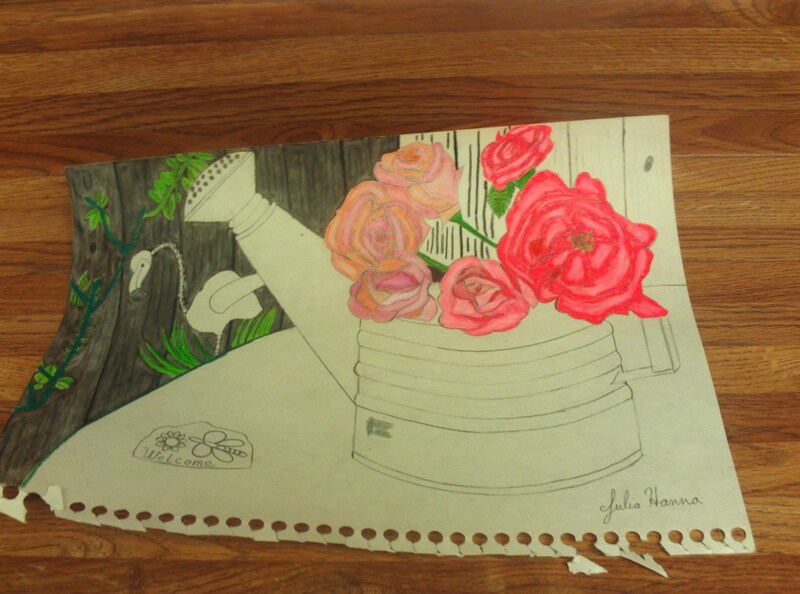 Julia, I love the finished drawing of roses....so nice to see one of your projects again. Very nice, haven't see this hub before. I did a sketch of Anna for my newest hub last night, not trying to get you to read it but it is at the bottom if you wanna take a look. Life goes on, one. I know what you mean, but I was just looking forward to what you were creating art wise. I will be showing it off whether it is good or not, lol, if I ever get going on it. I did buy some smaller canvas to practice on. 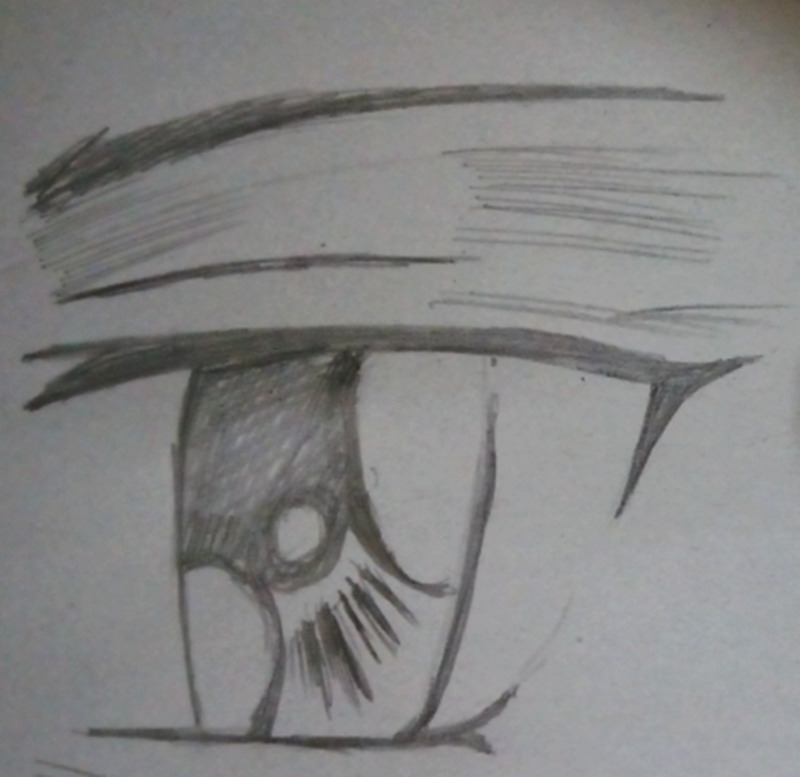 I hate to take a chance it may be good on bad paper, that is how my others went. One of my mom just on plain paper and years turn it into dust so I will do new ones and probably start with your idea here cause I love it! Uh well I won't copy your picture but you know what I mean! Thanks for the lovely comment, DDE! Thanks, Jackie. I will have to see some of your art, too! Always love looking at what other people create. Wow I will have to bookmark this, I am just getting ready to try my hand at it and you are good! I discovered a few years back I could do faces while I was just doodling one day so I thought why not try my hand at other things and I do love flowers and your type of art here. Thanks! 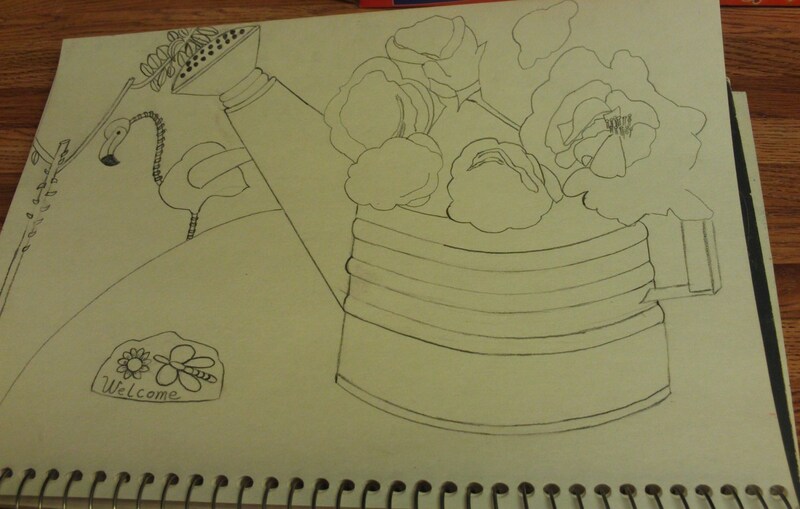 Drawing A Picture of Roses is a beautiful thought and roses are beautiful too. Your talent shows enormously. I wish I lived near highway one, but I am in the Inland Valley, which is near the San Bernardino Mountains. It's been too long since I've written an art hub essay, I've got one in the works... your words are a good refresher! Be well, wave to the ocean from highway 1 for me! Such a nice comment, Ben. I appreciate this. Lots of fun SweetiePie, thanks for taking us through your steps and for guiding people to art, they need it! Also, kudos to you for honoring your friends photo, not everyone gives props where they are justly deserved. You are my California sunshine, thanks for representing your state in the beautiful way that I see it from here. Have you tried Zazzle, Rochelle? I think maybe you could have some luck with that, since you are into art. I think the one with my artwork is "How to Win a Poetry Contest". 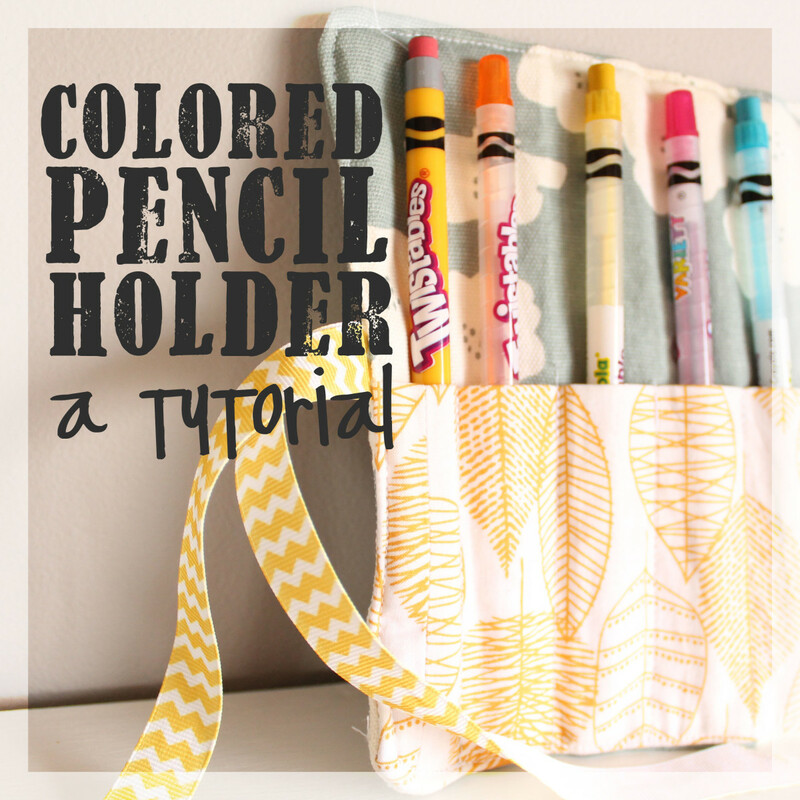 I really do like the Prismacolors, and I will have to check out some of your hubs with artwork. I didn't seethis earlier, SweetiePie, but I think this is one of your best ever. 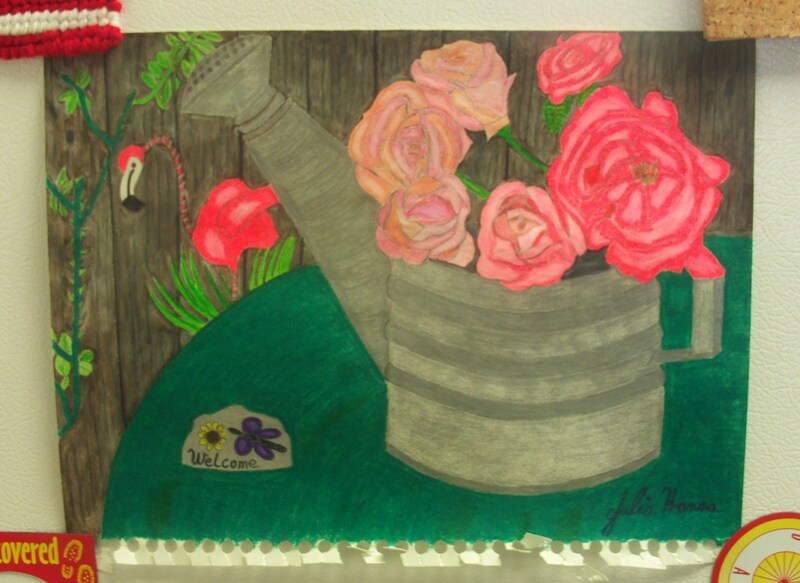 I like the way you interpreted the composition and gave the flowers and watering can prominence. 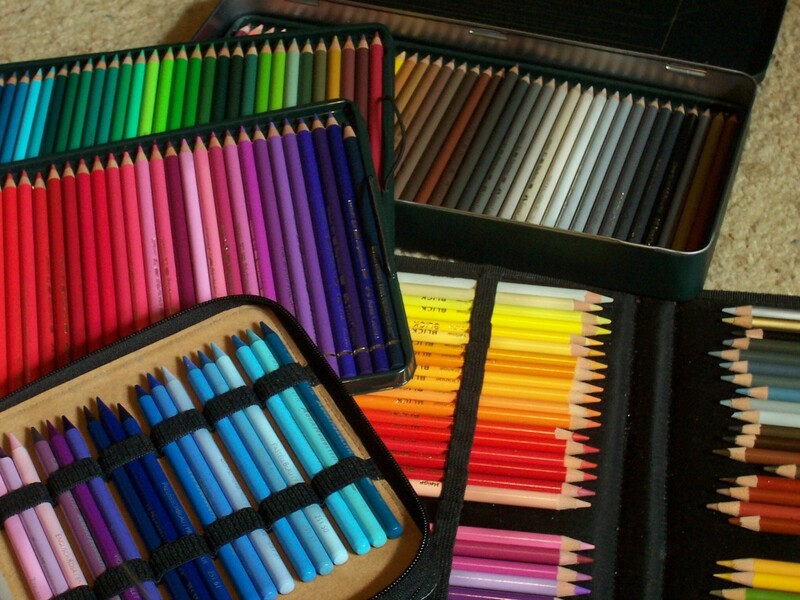 I like to use Prismacolor pencils, too. They give you good dense color without the mess of paint. Carry on! Thank you, Ethel! I think the Prisma Color colored pencils help to give this effect. I truly like having a few of this brand to help extend some of my cheaper colored pencils. Thanks, Nancy! My friend Wanda inspired this drawing with her lovely photograph. I just love your drawings, Julia. This one of the roses is absolutely charming. And you certainly are good at teachers others. Very nice. What a beautiful step-by-step on how to capture the beauty of roses on paper! Very inspiring!!! I so enjoyed your art presentation. You can always use applications to transform photographs into looking more like illustrations. There are several that do this very well. I love gardening, and I love photographing gardens. But I have never done illustrations, this is something I'm not deft at. I appreciate your comment Movie Master! The detailed instructions are excellent as is your finished picture! Excellent work and voted up. That really came out well, Sweetie Pie. You are to be congratulated.